ezyCollect is a secure, cloud-based accounts receivable and debtor management solution developed and created specifically to help SMEs (small and medium enterprises) streamline and automate their collection process. Essentially, the software helps users get paid faster without exerting too much effort and this results in enhanced cash flow and profitability for their business. By automating the entire receivables management process of your business, ezyCollect helps you get paid faster and in time, slashing overdue invoices by as much as 47%. Setup is quick and easy and once you are ready to go, ezyCollect takes care of your collection activities automatically, saving you precious time that you can channel on other matters. ezyCollect is designed to help small and mid-sized enterprises take total control over their accounts receivables and debtor management processes through automation. Created to help you get paid faster, the software is also intended to maximize the productivity of your staff. 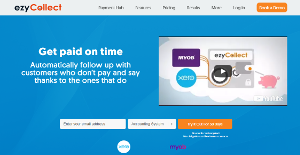 One of its most obvious benefits is its seamless integrations with Xero and MYOB, two of the most popular accounting applications in the world. This speeds up many accounting processes, saving you and your team time and effort needed to ensure the accuracy of your invoices and other financial and accounting aspects of your business. With ezyCollect, following up on overdue invoices is a thing of the past. The software tracks all the monies owed to your business and automatically send follow-ups to your debtors using friendly robots. And because it is the system that is chasing your debtors and not you, you have more time you can dedicate to other tasks. ezyCollect also makes it easy for your customers to pay and settle their invoices. You can add a custom “Pay Now” button to your invoices, statements, and emails in three simple steps. When they receive their invoice, they can quickly pay what they owe you with just a click of a button. What Problems Will ezyCollect Solve? Your small and busy team can get on with the job while ezyCollect deals with the business of getting you paid. Less stress: Cut the tedious follow-ups. Let friendly robots do it for you. Less mess: Track all monies owing to your business. Never lose track of debtors again. More time: Stop losing a day a week chasing debtors. Easy for your customers: Send the reminders your customers rely on and accept payments online. Systematise accounts receivable management while maintaining the personal touch with your customers. Support growth: Scale your system of debtor management to match your customer base. Stay personal: Don’t be cold. Automate polite, personalised reminders that come from you. Be bold: Collect quicker and have the cash and confidence to pay the bills and grow your business. Be systematic: Use scheduling tools to organise and coordinate all your debtor management activities. Accountants and bookkeepers can leverage the cloud to get deep insights and help clients survive and thrive. Save time: The system crunches the numbers for you. Add revenue: Your firm benefits from new revenue streams. Back yourself: Use ezyCollect in your own professional services firm and get paid faster. Every company has different needs and needs a system that can be customized for their size, type of employees and buyers, and the specific industry they are in. For these reasons, no platform can proffer perfect functionality off-the-shelf. When you try to find a software system, first be sure what you want it for. Read some ezyCollect reviews and ask yourself do you desire basic tools or do you want sophisticated tools? Are there any industry-specific tools that you are looking for? Obtain the answers to these queries to help your search. There are multiple factors that you need to mull over and these include your finances, particular business wants, your organization size, integration requirements etc. Take your time, check out a few free trials, and finally choose the system that offers all that you require to enhance your firm competence and productivity. How Much Does ezyCollect Cost? We realize that when you make a decision to buy Accounts Receivable Software it’s important not only to see how experts evaluate it in their reviews, but also to find out if the real people and companies that buy it are actually satisfied with the product. That’s why we’ve created our behavior-based Customer Satisfaction Algorithm™ that gathers customer reviews, comments and ezyCollect reviews across a wide range of social media sites. The data is then presented in an easy to digest form showing how many people had positive and negative experience with ezyCollect. With that information at hand you should be equipped to make an informed buying decision that you won’t regret. What are ezyCollect pricing details? What integrations are available for ezyCollect?